Frank and Kathy Hogan of Quincy MA have been pushing to make the iconic World War II rally cry, ‘Kilroy Was Here’ a stamp since 2005 alongside Patrick Tillery who created www.kilroywashere.org. The fight was most recently reactivated when Kathy met U.S. Rep. Stephen Lynch and Katherine Shea, District Representative, at a local celebration of the Fourth of July. Kathy wrote and told him about the idea for the stamp. Congressman Lynch is on the Federal Workforce, U.S. Postal Service and Labor Policy Subcommittee and was really enthusiastic about the project. Soon afterwards, he wrote to the Postmaster General to support the stamp effort. ‘Kilroy Was Here’ is an American popular culture expression, often seen in graffiti. The origins of it remain clouded by urban legend, but most historians agree that the most credible source of the saying comes from a shipyard in Quincy, Massachusetts. The most common story of its origin comes from James Kilroy, worked at one of the country's most prolific shipyards in Quincy as a rivet inspector. Kilroy was paid by the number of rivets he checked and recorded his day's work on the machinery itself with a chalk mark. 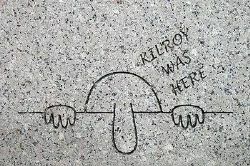 To avoid having his marks erased and moved by unscrupulous workers continuing his line of rivets, historians say Kilroy began inscribing ‘Kilroy Was Here’ on the machinery. The dire need for ships overseas meant that most were launched into action before the workers' marks, including Kilroy's, were painted over or covered up. American GIs began noticing the puzzling phrase scrawled on outgoing ships almost immediately, often tucked into hard-to-reach spots. At first, sailors treated an appearance of 'Kilroy Was Here' like a kind of talisman, certifying that their ship had been properly checked and would be protected against the enemy. GIs later adopted Kilroy's standard and began tagging the places they'd visited across Europe, Asia and Africa. The phrase and the distinctive accompanying doodle—a bald-headed man (possibly with a few hairs) with a prominent nose peeking over a wall with the fingers of each hand clutching the wall—is widely known among U.S. residents who lived during World War II. Frank and Kathy believe that there is an international importance to this stamp as 'Kilroy Was Here' was written all over the world and still is to this day. "The drawing brought humor to the soldiers during the war and gave them something to laugh about" said Kathy of why this stamp is meaningful to her. When Frank came to Quincy from Liverpool, he said that he saw a car that had 'Kilroy Was Here' on the back and followed it to a gas station to ask about it. The person driving gave him the address of James Kilroy in Quincy. Up until then, Frank did not know that Kilroy was a real person and set out to find out more about him. From there, he contacted Kilroy's family in Ireland and learned about the history. After following the trail even more, Frank and Kathy went to Washington D.C. to see the World War II memorial which was originally not supposed to have the 'Kilroy Was Here' emblem on it. It surprised and amused people so much when they unveiled it that they decided to keep it on there. As a teacher, Kathy also believes that this stamp would be a wonderful way to get kids interested in learning about World War II. The World War II veterans that Kathy and Frank have talked to would like to see this stamp happen during their lifetime. According to Frank, more and more WWII vets are dying so the push to make this stamp a reality is even greater than before. Announcing the stamp release would be a great publicity opportunity for Quincy on a national level (and hopefully be the spur for development of a ‘Kilroy Was Here’ exhibit). "Everyone wants to be a part of something and this stamp will bring communities together with humor. We've travelled all over and met many people because of 'Kilroy Was Here'. It really is a wonderful thing" said Frank of the stamp's importance. In 2004, Frank and Kathy suggested to Jennifer Logue, the initial director of Discover Quincy, that Quincy revive the history of ‘Kilroy Was Here’ and use it to attract more tourism. With her interest and enthusiasm, they gathered a committee and ran numerous promotional activities, mostly on board the USS Salem such as the KWH essay contest, a photo contest, and activities on the USS Salem at Fore River Shipyard. The photo contest was run with The Quincy Sun and attracted wide interest and yielded some amazing pictures of the KWH placard in places such as the Great Wall of China, Antarctica, Pearl Harbor, a swimming pool, a steel-workers memorial, Afghanistan, Iraq, a motorboat, etc. Application was made in 2005 to the USPS Stamp Committee suggesting 'Kilroy Was Here' be put on a first class stamp. Postcards petitioning the Stamp Committee were printed on board the USS Salem and distributed so that people could write and show their support. Sen. Mike Morrissey and Mayor Tom Koch have been among those who have written letters in support of this. The initial reply from the USPS had been that they liked the idea but that there was a backlog of requests. Kathy and Frank Hogan would like the Irish and Irish-American community’s help with honoring James Kilroy and making this stamp idea a reality. For more information about how to get involved, please sign the petition at www.kilroywashere.org or the visit their Facebook page. You may also contact Congressman Lynch and tell him that you want to vote yes for Kilroy.